What is East Lake’s class of 2019 taking with them to college? The right decor can turn that tiny dorm room into your home. For many students at East Lake High School, this will be their very last semester of high school before hopefully going off to college or university next year. With FSU acceptances just released and UF acceptance day soon approaching, college is right around the corner and coming up fast, leaving students with what seems like little time to prepare before the big day. Getting the obvious college necessities, like textbooks and school supplies, can be the most stressful part of preparing for a new semester of school, but the most fun part of moving away to school is getting to decorate and shopping for your new dorm room. There are lots of ways to make your tiny dorm room look super spacey and cute. One way to spice up your dorm room area would be by using pictures/frames to place around the walls or in a cute design or shape by your bed. 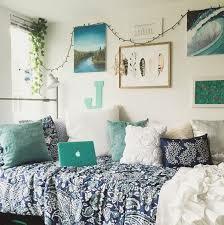 This can make your dorm seem more like home. Another cute idea is using Christmas lights to make your dorm look more inviting and festive. Senior Sara Mount states that she wants “something to make her dorm room not look so much like a jail cell, like a tapestry or something to cover the plain walls.” A color trend for dorm bedding and decoration is using pastel or light colors and balancing them out with a deep or darker color to create a color contrast that makes the space look well designed and stylish. Food is obviously another major college necessity, but with not a lot of space and little money to spend, it can be hard to find some go-to meals to eat with a busy schedule and little preparation time and/or materials. Seniors Wyatt Harris and Egan Beauvais say that they will be living on “bean burritos and Hot Pockets” while away at school. Other popular food items for college kids include ramen noodles and microwavable mac n cheese because they are fast, cheap, and easy to make. College meal plans are also very popular choices, especially for the underclassmen students, like freshmen. As many people know, college dorm room closets are extremely small and do not include storage space. Bringing good storage set-ups is key to being able to have as much clothing and other items squeezed into your closet as possible. Using a shoe holder is a great and useful idea to store stuff vertically, therefore using less space than covering the whole floor of the closet. The most important college necessity has got to be a laptop. Most, if not all, of college work is done on a computer, so it is important to have your own. Some people prefer an Apple Mac book and others are more Windows PC fans. Whatever computer you choose to bring or whatever design theme you pick for your room, it is important to be ready for a new school experience.